I first tried Insight Timer because I wanted a simple meditation timer on iPad. I was looking for a timer designed for meditation, rather than the in-built timer in Apple’s Clock app. In other words, I wanted bells, not beeping. Insight Timer is the most popular meditation timer in the App Store, and I had heard of friends using it. I decided to try it out. I was initially disappointed. Firstly, because I had to register before I could even use the timer. What was all this about? I just wanted a simple timer. After registering, my frustration continued because it seemed commercial, and cluttered with social features that don’t help me meditate. Judged purely as a no-nonsense meditation timer, I’d have to give Insight Timer a poor review. But as I started playing with Insight Timer in preparation for this review, I realised that perhaps I was being unfair. Insight Timer is not really a meditation timer app, despite the name. Rather, it’s a social meditation platform that includes a timer and a whole lot more. 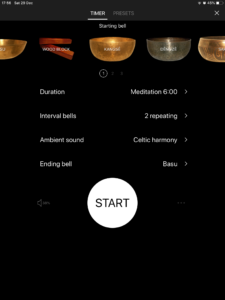 If you’re looking for just a simple timer, look elsewhere (I can recommend MindBell on Android, and I’ll be reviewing some iOS meditation timers in future). So it is as a social meditation platform that I will judge Insight Timer in this review. But first, let’s look at the timer feature, because it is actually pretty good. The timer has plenty of options (perhaps a little too many). Firstly, there’s a good choice of bells, all of which have good quality audio. You can set any of the 10 bell types as starting bell, ending bell, or interval bells. You can set the bell to strike 1, 2, or 3 times for each start, end, or interval bell. What are those 10 bell types? 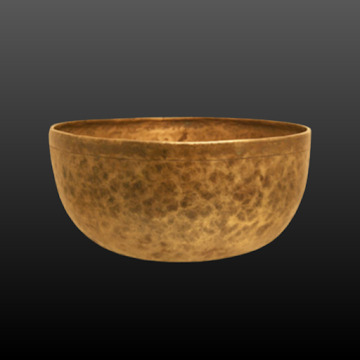 Basu is nice little high pitched singing bowl, which feels perfect for ending a meditation. Wood Block is a short but pleasant sound of wood knocking together. Kangsê and Dêngzê are medium sized singing bowls. Sakya is a small singing bowl, but not quite as high pitch as Basu. Ombu, Zhada, and Shürong are larger, deeper singing bowls. Gong Hanchi is perhaps my favourite of all the sounds, but this large gong is perhaps a little overblown for a typical meditation session! Finally, you can select None. It’s even possible to do this for interval bells, which are optional (this makes no sense to me). You may be wondering where all these exotic names come from. Most of the singing bowls are named after places in Tibet. You can set any number of interval bells. You can even set multiple different bells to create some elaborate pattern of intervals. The possibilities here are intriguing but it feels like the user interface is not well designed for the simple and common case of a single bell repeating at a regular interval. You can optionally select one of 19 ambient sounds: Moonlight, Zen guitar, Eternal stream, Deep Om, Raindrops, Bird song, Celtic harmony, Nature’s melody, Ocean wave, Reflections, Stillness, Tibetan sunrise, Angel choir, Enchanting, Into the wild, Limitless, Lucid dream, Secret garden, and Winter fire. These can be helpful, particularly if you are struggling to relax into a meditative mood. Configuring all this can take some time, but luckily there is a feature to save as a “preset” so you don’t have to reconfigure it in future. My top tip: if you are using Insight Timer primarily for the timer, and you are not so much interested in the social features, be sure to go into the profile settings and set the opening tab to “Timer” instead of “Today”. There are also Timer Settings where you can set Bell strike interval, background image, and auto-lock delay after finishing a meditation. Unless you have changed this setting, Insight Timer will open to the Today tab. This shows various stats that emphasise that you are not alone in your meditation. You will see that hundreds of thousands of meditations have been completed with Insight Timer each day and thousands of people are meditating with the app right now. You will be shown a world map with the locations of the people who currently meditating marked as dots (I’m assuming this, it doesn’t actually explain it). Below, you will be shown specific examples for from the Insight Timer community. For example, “Donald Trump is meditating for 30 minutes with the Timer” (OK, that’ll never happen, but I think he should). Users who have meditated every day for the last year are shown with a “365” badge. If you don’t want to show up to other users, you can change it in the settings under Privacy. Insight Timer claims to be the most popular meditation app, when measured by hours of usage (despite having fewer downloads than other apps like Headspace). This makes sense, because Timer is such a prominent feature, and many experienced meditators prefer unguided meditation with a timer (also, because some of the guided meditations are in fact music, so some people may use then regularly as background music for focused work). Also on the Today screen, you can add friends or view nearby meditators. You are also likely to see a banner highlighting new guided meditations or courses. Are these social features useful? Although it’s cool to see that many people are meditating around the world, I personally do not have much interest in these features. If I want to meditate socially, I would prefer to go to a meditation group in person where I can truly interact with others instead of just seeing them as statistics. If I’m meditating at home, I’m content to just use a simple timer. But perhaps some appreciate these features more than me. There’s another aspect to this: Insight Timer keeps a record of all your meditations and can show you stats. You might find this interesting, or you might not. I do not do all my meditation with Insight Timer, so it does not give a complete picture, rendering it a bit pointless. Keep in mind that pretty much all your usage with Insight Timer is tracked and saved online by Insight Timer. If you have privacy concerns and prefer not to be tracked, you might prefer an alternative timer with no social features. My personal view is that I don’t want to be tracked unless there is a very good reason to be, and since I do not see much value in the social features I would rather not be tracked. The fact that I spend 10 minutes at 8:30am on Tuesday sitting on a cushion in London does not need to be in the cloud. Insight Timer could do a better job of providing privacy options to users: although there are settings to hide your usage from being publicly visibility, there are no settings to disable the tracking features in Insight Timer (there is a “Don’t log session” option after completing a meditation, but it is hidden away in a menu and you would have to remember to use this each and every time). 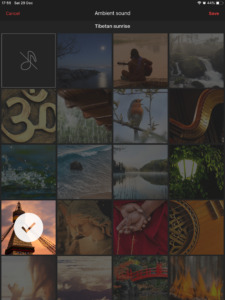 Insight Timer boasts 12,000 meditations, which they claim is the “largest free library of meditations and music on earth”. 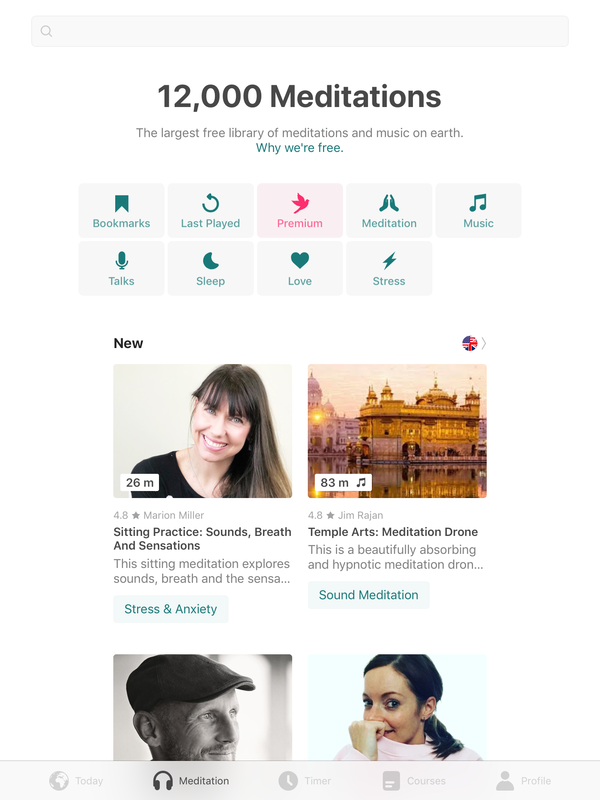 The range of free meditations available is indeed impressive, and this might be one of the best reasons to use Insight Timer. Although the meditations are free, there is an “Insight Premium” subscription for £55.99/year ($60/year), which allows you to download them, listen with higher quality audio, and use a more advanced player. Part of the subscription revenues are distributed to meditation publishers. Publishers’ earnings are determined based on play count, ratings, engagement, and shares, but there is no clear formula set out for this so it should be considered extra pocket money rather a reliable basis for a business! If you don’t have the subscription, and try to rewind or restart the meditation, you’ll be shown an upgrade pop-up for the subscription. This feels overly pushy. 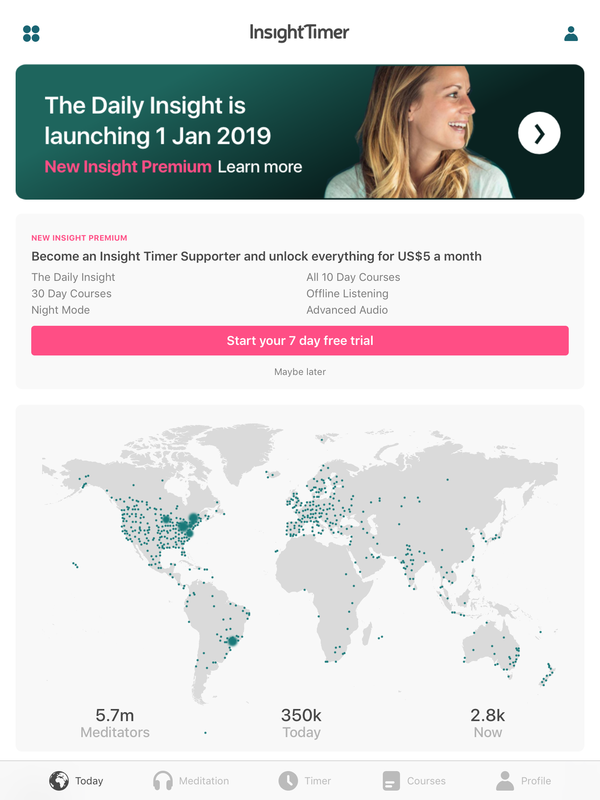 Insight Premium has just been updated for 2019: it’s now more expensive, but includes additional features, including a night mode (a dark theme), “The Daily Insight” (a daily curated meditation), and access to 10-day and 30-day courses. Courses are a paid feature. You can get purchase them separately, or get access to all with an Insight Premium subscription. A decent proportion of the earnings from these courses go to the teacher. Teachers will receive 50% of the income that Insight Timer receives. But the App Stores also take a cut first (about 30%), most territories will include sales tax/VAT, plus there is a fee for PayPal transfer in order for the teacher to receive payments. So all-in-all, we are looking at a course teacher receiving less than a third of what customers spend on courses. Although I believe Insight Timer are making a serious and well intentioned effort to create an ecosystem where teachers get paid, there is plenty of scope for disruption here in years to come: a decentralised platform with cryptocurrency payments could give teachers close to 100% of the revenue. The typical pricing is £4.99 to rent a course for a single play, and £19.99 to keep the course for unlimited replays. Don’t feel the need to make this choice when buying: you can pay the difference to upgrade later (it’s a bit cheeky that they try to sell the higher cost option prior to listening). 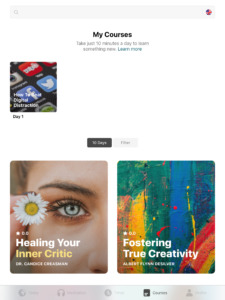 You can also access all courses if you are a Premium subscriber (this is a new feature for 2019). Insight Timer is a valuable app for meditators. The timer is good, and the volume of free guided meditations is impressive. Some may appreciate the social features more than I do. Most of my complaints about Insight Timer relate to the commercial side of the app. 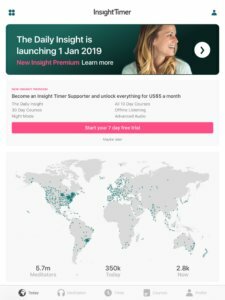 Insight Timer is run by a for-profit company, however they have committed to keeping many of the features of the app free to use. They have committed to not have advertising in the app, which is admirable. But the consequence is that in order to make a profit they do need to actively up-sell, which feels like advertising except that they are only advertising their own in-app purchases. It’s not easy to balance the intention to make a profit whilst providing a pleasant service to users even when they are not paying. I would prefer the app to be less pushy, and although I understand the need to make a profit, as a user I would give preference to less pushy apps where they exist (and if all I want is a meditation timer, they do: for example MindBell on Android or Meditation Time on iOS).